most of the keyboard stuff I do in Blender I'm not even conscious about doing it at this point. It's like pointing and clicking before you even look at where the mouse is going, the body knows the motion before the brain starts consciously processing it. Muscle memory, co-pilot, whatever you want to call it, it takes over after a short time. That's the one thing I don't think of mentioning that is probably key to understanding why someone would want to use shortcuts. They aren't really useful until we don't have to think about them but rather they are just automatic. It's like learning to type. If we have to hunt and peck for the keys it's a royal pain, but if we type without even thinking about the keys, it becomes as natural as speaking at some point. I personally found learning the shortcut keys in Blender much less effort then learning to type, but it does take some practice. The fact that Blender uses common sense shortcut keys for the most part, like r for rotate, s for scale, e for extrude, g for grab, etc... means that the shortcut keys piggyback off of our already built up knowledge of basic typing. One other thing to point out about shortcut keys that people who don't use them wouldn't necessisarily know, many of the keys are for menus, not specific items, so shift+a for the menu to add an object to the scene or ctl+tab (when in edit mode) brings up a menu for changing between vertex, edge, or face mode for instance, means that we are learning fundamental shorcut keys for moving around and menu shortcut keys for a whole list of options. There are shortcut keys for some of the esoteric functions in Blender which I would never bother to learn, that is unless I used that particular esoteric function all the time in my particular workflow. While I'm thinking of it, there is one thing that can throw people off when using shortcut keys in Blender. Since Blender has various 'modes' (edit, object, sculpt, paint, animate, etc...) the shortcut keys in one mode may do one thing while in another mode might do something else. The basic shortcut keys such as for moving around in the scene work across all modes, but more advanced shortcut keys such as menus are specific to the mode we are in. This can be confusing as initially we might expect one thing from a given shortcut but if in the wrong mode where that doesn't make sense, the shortcut key may be assigned to something else that does make sense for the mode we are in. Ctl+tab will only bring up a menu to change between working with verts/edges/polys if we are in edit mode for instance, not object mode as we don't work with verts, edges or polys in object mode. Much simplier than the one I learned on many moons ago lol. I like those types of cheetsheets also, but in my learning I found concentrating on a handful of shortcut keys at a time was easier to tackle. I started with the basic 'getting around' type of keys, then the basic modeling keys and some basic menu keys (like ctl+tab in edit mode, w (specials menu,) etc...) Then expanded out from there. The cheetsheets for me were basically a reference until I had the fundamentals down. For some I think they might be intimidating as one can be overwhelmed, especially as some refer to functions one doesn't even understand yet. Gedd, thank you for those links! I completely missed them, so I will spend some time with them in coming days. Brad, I've been watching some of Andrew Price's tutorial videos. 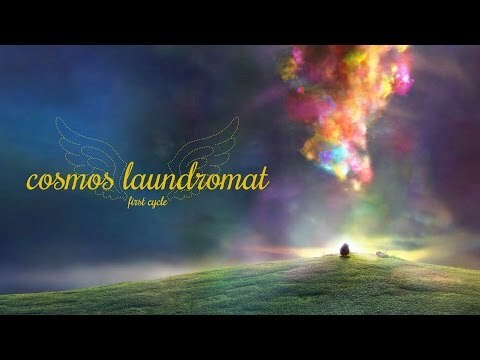 I like his enthusiasm and how he has found his way in life with Blender. Well done! I was in Blender quite a lot in the last two weeks. Haven't modeled any "keepers" yet, but that's not my purpose yet. I'm taking on little tasks as I think of new things I want to learn. So finally this past weekend when I had to use DS to complete some small clip-art for a newsletter that I write, my fingers kept trying to use the Blender mouse buttons and key bindings for panning and stuff. I hadn't thought that Blender was starting to stick on me, but I guess I've been finding my zone in Blender. It was simultaneously weird and wonderful to think of DS mousing and key bindings as "the weird one". It was weird because it didn't used to be that way. It was wonderful because I think there's plenty of evidence to suggest now that Blender is actually more "mainstream" and DAZ Studio is less, mostly because DS can't do landscapes or modeling. Kyoto Kid, your comment above made me think that maybe you're making it more difficult than it needs to be. But then don't we all? One day some few years ago, I was talking to one of my nephews who was really into a certain video game. He knew EVERYTHING about this game. How to jump, roll, kick, punch, block, and do something called "bunny-hopping". He's a teen now, so he calls that "B-hopping". He knew all the easter eggs, he knew the whole backstory of this game and all of its hundreds of characters. He knew this game's fictional world probably better than he knows his own US history, which something that really happened. I'm convinced that school is made needlessly hard because we still teach kids (and ourselves) to memorize stuff. We tell ourselves "it's hard", but it's not the subject matter that is hard, it's the way we try to force ourselves to learn the subject matter by using obsolete learning techniques! Our learning (and self-teaching) methodologies are so old school and so very inefficient and now as adults, we perpetuate the pain by using the same inefficient ways that those teachers did so long ago! To a point, I blame our school systems for being so cookie-cutter in their ways, but that's another topic for another day, and really it doesn't need to stand in the way of me figuring out TODAY how I learn best. Blender is not about "memorizing" shortcuts, at least not for me. It's about using the software regularly, and finding cool stuff that I can get excited about. By doing that, I find myself just remembering one new thing at a time. Because I'm excited about the subject matter, I'm learning in rapid succession. Mostly without conscious attempts at memorization. I'm basically just following in my nephew's footsteps! And then I let myself get curious about stuff. I can't tell you how often I've said, "I wonder if there's a faster way to blah-blah." Then I look it up and try it. I find myself saying quite often, "Whowwaaa, that's AWESOME!" And the next thing is, "I want to do that blah-blah some more." So I practice that one thing about 5 to 10 times. By practicing that thing that I'm already excited about, I just "remember" it. Memorization is a chore. It's hard and un-fun. "Just remembering" stuff I'm already enthusiastic about is EASY! Then those actions become natural; sort of like finding a Bb note on a sax, but only if you've been playing a lot of Bb notes on a sax and you like playing them (along with a bunch of other notes)! I think using Blender (or any software really) is more about "playing it" like an instrument than it is "memorizing tasks." When you play it long enough, it starts to become natural. When you find "the zone", it's less like you're using software and more like playing a music instrument that you've gotten really good at playing. Or a video game that you love so much that you know all the characters and in-game history. Or a sport that you've played for thousands of hours, developed strength and dexterity, and found "the zone". Or driving a car that you've put in tens of thousands of hours and still enjoy driving on the twisty back roads because you know the car's steering, clutch, and shifter. There is nothing more powerful than having the inquisitiveness of a child. I know this, but I still constantly have to re-realize it. One other thing: It also helped me to stop my inner voice (the anti-muse) from telling me that Blender was hard. It was the same "you can't do that" voice of doubt that sometimes comes from other people, but often comes from inside us too and prevents so many of us from being successful in our dreams. Once I got him to go take a nap, it helped my learning process. He takes more naps now, and I'm having more fun. It's another great example of what Blender is capable of. Content warning, this isn't for kids. if you don't want to learn keyboard commands (right away anyway) I do like the ability to hit the space bar and just start typing what you want to do and see what pops up relitive to the mode your in and you can select them from the contextual menu. I think I need a special keyboard with just 4 keys for the above functions. When I die and St. Peter is cataloging my life, he'll probably have one line item like, "wore out 10 keyboards in his life, all with malfunctioning CTRL keys (but only on the left side)". Right after "used 11,554.4 rolls of toilet paper. (1)"
This is nice; I use space bar a lot too. In addition, I like to keep the manual open and I use Google search extensively, ending my search terms with "in blender". Even badly done YouTube videos can be very helpful! Here's what I'm working on today, Fluffy clouds! more importantly low memory impact clouds. Volumetrics are fun and all, but they send my computer to a grinding halt. these on the other hand are really just a bunch of instaned cubes. Something that surprised me at one point was the drag-and-drop feature in Blender. For example, if you're working in the video sequence editor, you can set your frame number and drag a video file from an open folder on your desktop onto the time line and Blender loads it automagically. Ladies and fellas, I am blown away by Blender's support of mirroring and multiple-nested arrays. Seriously, I saw Andrew's video on creating an apartment building by making only one apartment of one floor. He mirrored it to make a full side of the building (but only one floor tall), then made an array of 4 of those to create the entire floor of 4 (or 8, depending on how you might design the internals) apartments, then made an array of 14 of those on the Z axis (Blender's Z goes vertical, in opposition to DS). Bam! A 15-story apartment building, complete with glass windows and balconies. Some videos are a worthy use of your time, not necessarily because you'll learn the minutia, but because you can quickly see a realtime application of features and concepts to make you see some of the possibilities. And it's a better use of my time than anything on television these days. 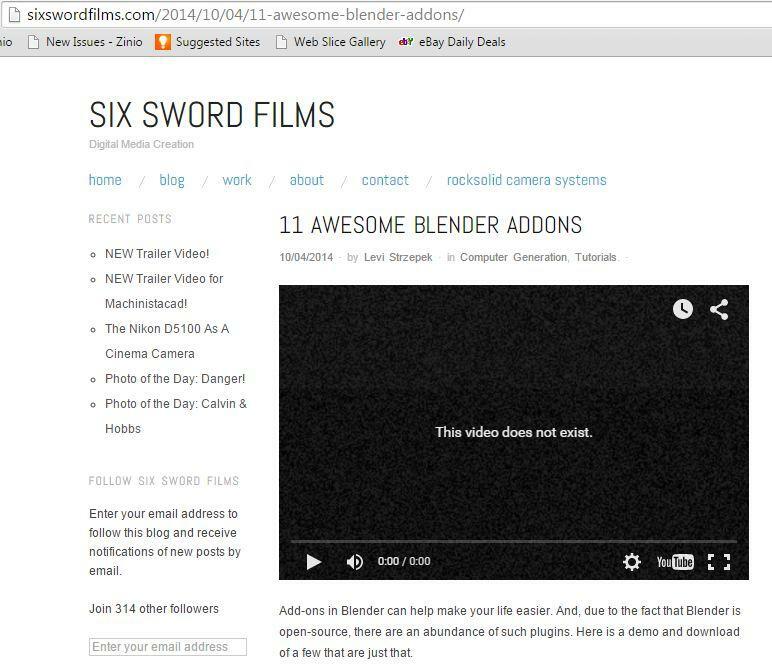 ...that is ridiculous and one of the main reasons I cannot eal with Blender's UI. Again with the majority of software on the market, shortcut keys are usually an advanced concept that most "beginners" would not use. The fact that a tutorial is needed just to figure out how navigate the workspace is a big strike against Blender in my book. It really disappoints me as Hexagon is terribly unstable. and both Wings3d and Silo (even given the update) are not as powerful as much as Hexagon is (when oit doesn't crash). Tis is why I have not done much with modelling even though I have a tonne of concepts I'd like to realise. I cannot afford 3,400$ for 3DS Max or even 2,100$ for the latest version of Modo (which actually has a very nice UI). My real peeve is all these applications going the 'Swiss army knife" route of trying toi cover every aspect of 3D production than just focusing on a specific task. This is why I keep hoping (against the odds) for an update of Hexagon. If all you want to do is model, look at Silo. Glen Southern has many good tutorials for it. ...downloaded and installed the trial. Crashed it wiithin 15 minutes. I already have Hexagon. I paid good money for it (original price 149$) before it got sent to the "Daz discount bin". Really disappointed by the instabilities as the UI and tools are very well laid out for someone like me who works from an artist's rather than a techncian's perspective. There's a long list of modeling app's to pic from. Frankly, I am really put off by the "Swiss Army Knife" approach so much 3D software follows (even Modo went this route). I just need a dedicated modeller with a good set of UV mapping tools as I already have all the other features covered by other programmes like Daz, Carrara, and Bryce..
With the new interface, you don't really need to know all the shortcuts, there are menu options available. Shortcuts will speed up the process significantly though. Blender takes some getting used to, but you pick it up quickly enough, especially if you already know the principles of 3d modeling. I've posted this in a few other places but I was one of the people who tried Blender for years and just could not understand it. 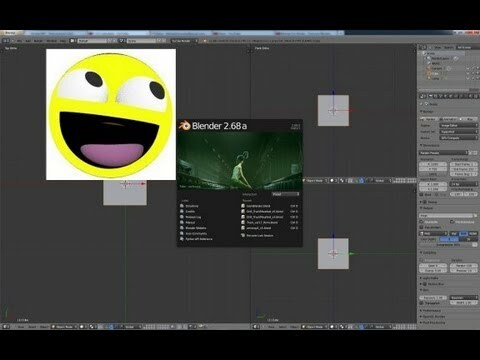 Not too long ago I stumbled onto BlenderForNoobs YouTube channel and if you are having trouble getting to grips with Blender's interface I highly recommend his "Learn Blender in an Hour" video. Just following along with it got me so comfortable with the basic interface in literally an hour (OK maybe an hour and a half because I paused it a few times) that I was astonished I ever thought it was hard. He's got a great series of 10 or so intro to modeling videos too - they aren't going to teach you modeling but if you take a day and follow along with them you'll be completely comfortable with all the most basic modeling tools. I realize this doesn't help people who just don't learn that way and need or prefer to have it in writing, but if you can learn by watching and trying then I cannot recommend these videos enough. I took a weekend to go through them and play around and went from "WTF" to "I totally get this layout now." The layout actually makes sense to me now. Thanks MDO, that link was very helpful! I actually find Carrara's modeling pretty good, though I haven't done anything super advanced with it. With several radically different approaches (metaball, primitives, lathes/extrusions, vertex modeling) and the ability to convert to vertex from the other methods and the ability to combine or remove shapes... it manages most of the basic stuff I need. Hollow pipe, pyramid, curved sword blades, spheres with tiny spheres cut out (experimenting with fog and rays), vaulted ceiling, etc. ...again video tutorials, even well produced ones, don't do much for me as I don't have good retention. Text based tutorials work far better for me as like I mentioned, I can have the page/section with the specific task opened all the time on my notebook computer while having the programme I'm learning on the workstation without having to spend a lot more time to stop, start, backup, and replay.the tutorial over again and again. I even bought a copy of Blender for Dummies and still had trouble dealing with the UI and the programme's set up. Between Hexagon's instabilities and Blender's difficult to grasp UI (at least for me), I've spent little time actually learning modelling principles as I was either dealing with losing work (Hexagon), or just found myself stymied (Blender).